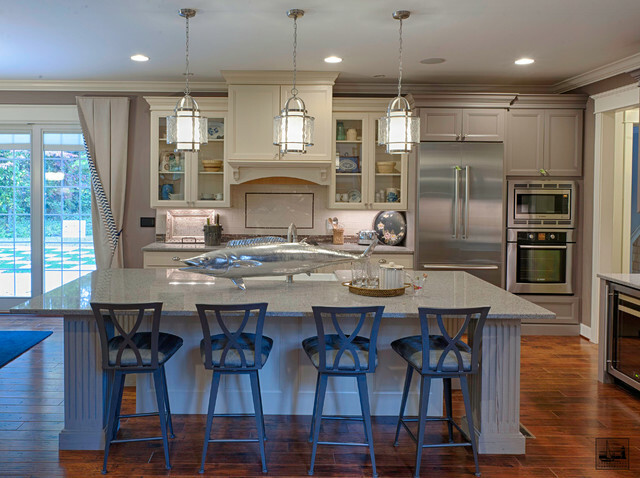 Cabinets, floor and paint color - Lots to like here! Who is the cabinet manufacturer? What are the cabinet colors? What type of wood and stain is the floor? Finally what is the paint color on the floor? Thanks and nice work! Hi, We used Dacora Cabinets in Stone and Jasmine. The floor is an engineered Green floor from Lumber Liquidators HSWBSM5. The wall color is Spalding Grey from Sherwin Williams. The 4 columns at the corners of the island were made from recycled wood from a 100 yr. old warehouse in Baltimore. Fish - Where could I get or locate the silver wahoo on the bar? You can get it at Details of Design in Annapolis for $598.00 and they include free shipping. Ask for Megan 410-269-1965. It is made of fiberglass so it is lightweight.